HomeUncategorizedCreativity – An Accidental Skill? Creativity – An Accidental Skill? ManipalBlog, in the process of streamlining its posts decided to go for a thematic set of posts, for each day of the week. Wordless Wednesdays, was one of the suggestions. But how do you blog, without words? The most you can do, is put up pictures and to some extent Videos! But then, a blog without words, is a bit difficult to carry out, right? This got me thinking, is Creativity, an accident or a skill? I don’t buy the myth of the lone genius, and the sudden flash of inspiration. The problem with creativity is the myth of individuality. I feel, creativity is a collaborative process. Building on other people’s ideas, whether you know it or not, whether they know it or not. And it’s a cultural process, building on what’s around you – context matters. For example, I was browsing the photo album of one of the bloggers at ManipalBlog – Shagun Dwivedi on facebook and came across an interesting idea, she had captured through her lens. I have reproduced the image below! 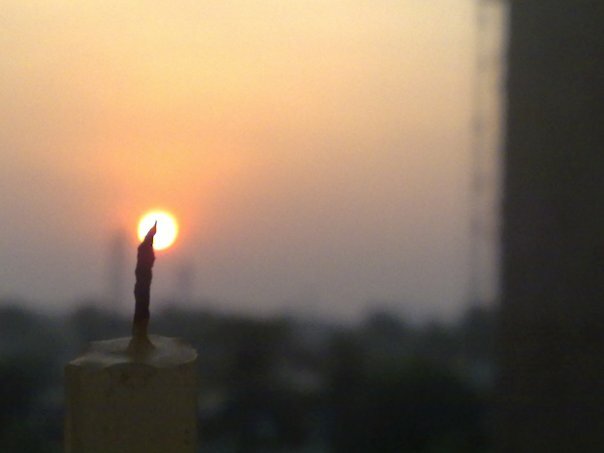 The Sun as a Candle Flame! Of course, many of you might have had the same idea, but to capture it so requires a certain amount of pluck! The comments on this photo of hers range from, applause to some cynics suggesting that Candle flames are not Oval! But (maybe because if that) the creative process is also messy. It’s never ending. It’s a matter of opinion. People like to post rationalise to make it look more ordered, or try to systemetise it. But look closely, and the spark, the lateral leap, is always the result of some messy moment, a happy accident. I think the real skill is recognising those moments, realising that’s the thing.